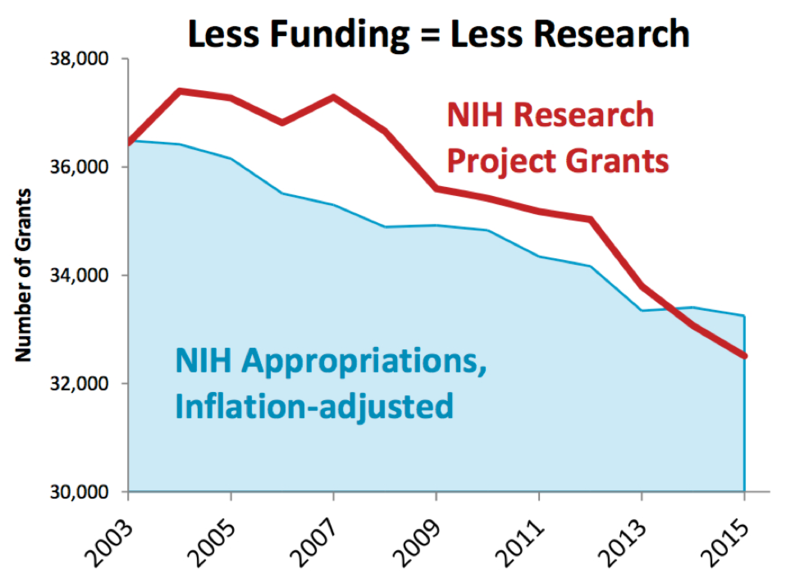 Funding is declining in many research fields—and only a few years ago, federally funded research was threatened with deep sequester cuts. Early-career scientists face increasingly impossible academic job markets and heavily over-subscribed research facilities as they look to their future careers, even at this critical juncture in history when society faces so many scientific and technological challenges. This pattern is mirrored in biomedical research, as described here by the Federation of American Societies for Experimental Biology (FASEB). Federally-supported research is one of the foundations of our economy. At this point in history, with existential scientific and technological problems like climate change and energy independence, and so much potential to expand human knowledge, from new cures for diseases to telescopes looking for the origins of our world and universe, declines in funding and a horrible job market for the next generation of researchers are avoidable mistakes. While our main goal as a union is to improve our working conditions, being organized also allows us to take on the big issues that matter to us, so that academics have a strong political voice. 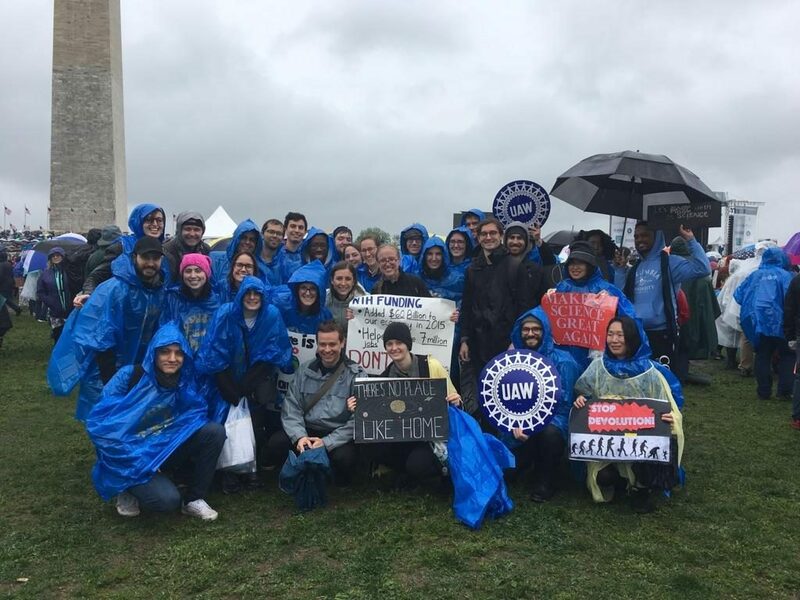 The UAW was proud to be a national sponsor of the March for Science to support members across the country as we advocate for our livelihood. Our union represents tens of thousands of scientists who work as postdoctoral researchers, graduate research assistants, and adjunct faculty at Columbia as well as from the University of Washington, University of California, New York University, University of Connecticut, Barnard College, The New School and theUniversity of Massachusetts. Most of our work relies on federal funding. Our union has a long history of being a vehicle to amplify the political voice of our members. In January we coordinated hundreds of people to attend the Women’s March and were excited to continue that legacy with the March for Science. On April 22, 2017 UAW members joined tens of thousands of scientists and science supporters in more than 600 cities around the world to advocate for the protection of science and science funding. We marched because science is critical to our health, economies, food security, and safety. We marched to defend the role of science in policy and society. BU Grad Union (BUGWU-UAW) is committed to continue the fight to protect science and science funding in the years ahead. Organizers from the BUGWU-UAW helped to spearhead the BU March for Science.